- Devin Funchess has never lacked athleticism, but he does seem faster and more elusive as a full-time wide receiver than when he was used as a hybrid tight end.. He is easily Michigan's best weapon offensively. 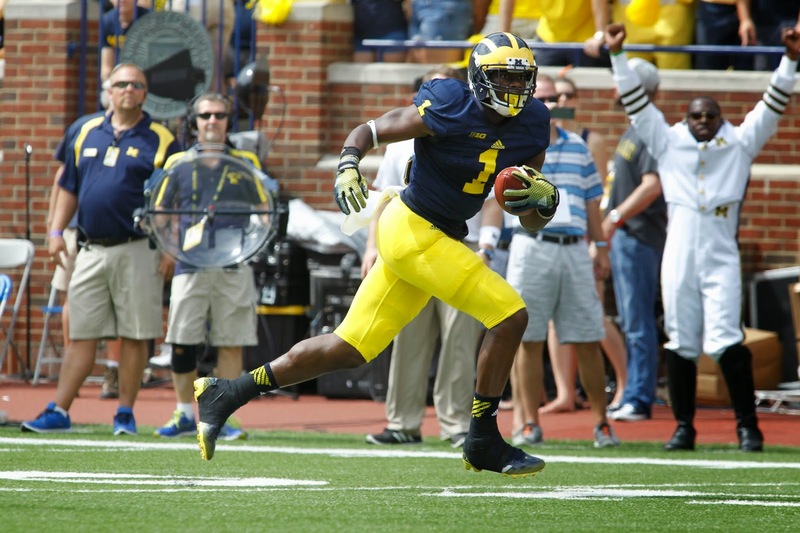 - Devin Gardner began this game throwing on time and on target from the pocket. It's not like he hasn't done so before, but he's lacked consistency. We'll see if he is able to maintain it against stronger competition. - De'Veon Smith is continuing to look like he is a better running back than Derrick Green. While ripping off a 59-yard run, Green looked fast for his size in the open field. But Smith did him one better with a 61-yard run followed by a TD. Michigan's run blocking came on during the second quarter. Kyle Kalis, disappointing last season, is having what appears to be his best game. - The most impressive unit today has been Michigan's defensive line. Taco Charlton became quickly overhyped his first spring practice, but appears much improved. Mario Ojemudia is having a very good game.